We live in an age of drone warfare, where the attacks on targets deemed to be threatening happens remotely. The decisions to kill are made covertly in rooms far away from the target, and we can now kill without being personally present. Killing has become all too easy and convenient. As a result, argues Laurie Calhoun in this provocative book, self-defense has become conflated with outright aggression, and black ops have become the standard military operating procedure. In this remarkable and often-shocking book, Calhoun dissects the moral, psychological, and cultural impact that these drone killings are having on modern society. 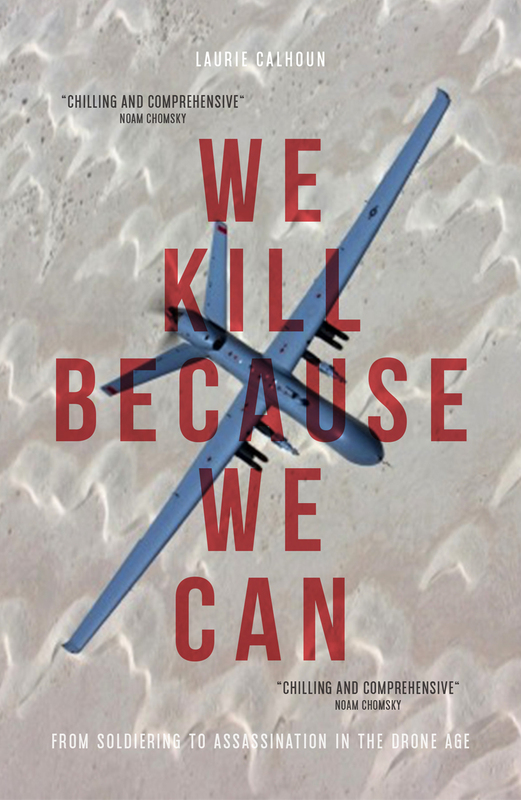 In We Kill Because We Can she draws powerful, thought-provoking parallels between drone operators and mafia hitmen as well as the Trayvon Martin case and the killing of a teen in Yemen by drone. The result is a timely and provoking analysis of Western foreign policy and its disturbing use of remote-controlled death. "Though US leaders have proclaimed the right to kill anyone outside America whom they deem a threat (including US citizens), this has not proven to be a perfect deterrent to those who oppose the US. . . . This is a dense, detailed, and relentless chronicle of the dismal consequences and (so far) minimal benefits of targeted killing; opponents of drone warfare will find plenty to bolster their arguments." "The drone assassination campaign is the most extraordinary global terror campaign yet conceived and executed. This chilling and comprehensive survey more than amply demonstrates that drone strikes are war crimes, and that this new technology is not only an effective device of mass murder at a distance, but that it also eliminates barriers for commanders to 'prosecute wars at their caprice.' That the technology will sooner or later be directed against the perpetrators is hardly in doubt, as the cycle of violence takes its predictable course." "In We Kill Because We Can, Calhoun poses worrisome questions that our government should be forced to answer, such as how an unarmed person can pose an imminent threat, and whether drones have inspired more terrorist attacks than they have prevented. Calhoun also makes some very searing but well-reasoned analogies between our government and the mafia; Bush, Obama, and bin Laden; and targeted killings as simply assassinations. The book forces the reader to question our government's policies in terms of efficacy, adherence to law and, most painfully, moral grounds. It is a clarion call to reverse course if we ever want to see an end to our military adventures abroad and what the author refers to as our 'single-minded obsession with lethality as a solution to conflict.' Read it and act!" "By far the best book on drone warfare and the ethics of targeted assassinations to date. Powerful and eloquent, Calhoun elucidates a set of convincing arguments as to why drone killing is ethically indefensible and strategically counterproductive, but also why it is so seductive to our governments. It should be required reading for politicians, military planners and journalists." "Targeted assassination through the use of Predator drones has become the most dramatic military novelty of the twenty-first century. Laurie Calhoun's brilliant enquiry into the mindset of its perpetrators and supporters is a chilling reminder of how far we have strayed from the concept of 'a just war.'" "A comprehensive and shocking survey of the dirty consequences of US drone strikes. Calhoun provides important information on civilian casualties, which puts the lie to the CIA's denial of such losses. This important work will be helpful in any re-examination of drone policy."